You'd thought you'd seen the worst of it - until the entire party plummeted to the lower lairs; a series of caverns that are deeper, darker and more dangerous than any you've yet known. But it's the danger from within that you must concern yourself with now. To see daylight again, you will need to use every skill and ability at your disposal. Remember... Without teamwork, you will never survive. Without betrayal, you'll never win. Welcome back to Cutthroat Caverns. 15 new encounters, plus a whole new game mechanic and unique character abilities. 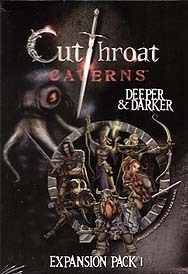 Not a complete game - You must have the original Cutthroat Caverns to play.